Make mealtime extra special with these Blackened Salmon Burgers with Herbed Cream Cheese. These scrumptious burgers are great any day of the week! Add the cream cheese to a mixing bowl and whip with an electric mixer until light and fluffy, about 1 minute. Stir in the basil, dill, parsley and pepper. This can be made a few days in advance and kept in the fridge. Bring to room temperature before serving. Add the salmon to the bowl of a food processor and pulse until it is finely chopped and similar in size to ground chicken. Alternately, you can chop the salmon very finely with a sharp knife.Add the chopped salmon to a bowl with the panko breadcrumbs, parmesan and 1 tbsp. olive oil. Mix with a spoon until just combined. Form into 4 equally sized burgers. In a small bowl, combine the brown sugar, paprika, cayenne, garlic powder and dried thyme. Season to taste. Sprinkle both sides of the burgers generously with the seasoning mix. Heat a skillet over medium-high heat with remaining olive oil. Cook burgers on each side until golden, about 3-4 minutes per side. Be gentle when flipping the burgers, as they are delicate. Spread the bottom half of your toasted buns with the herbed cream cheese. 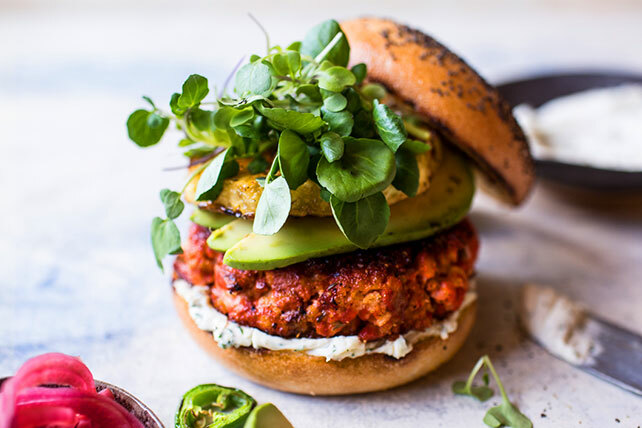 Top each bun with a salmon burger and then add your desired toppings. I highly recommend a slice of grilled pineapple!